Pulchesa is a fairly tall elf, at 5'6". She has dark red hair and blue eyes. With a fair face and body she tends to lean for loose clothes, which also allow her to conceal stuff easily. She has a tendency to wear light colored pants and dresses, and her shirts tend to be either blue or a red. 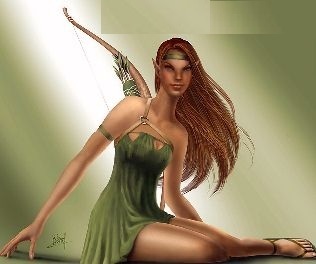 Her arms are particularly strong from the amount of time she spent drawing a bow and firing arrows, but the rest of her body appears rather frail. Whenever she went on adventures, she will also have a long silk rope draped around her. She is almost always wearing the same trench coat. It is a large blue trenchcoat with a lot of pockets in it. There are always a variety of stuff in the pockets, and she has two hidden pockets inside in which she keeps an extra dagger, and a flask of baijiu. On the bottom there are two pockets, one on each side, which are around 10 inches by 8 inches. On top of that, and to the side there were two more pockets around half the size of the first, and there was also 3 pockets by the top around 3 inches by 3 inches. She also always has her pouch strapped around her waist which she uses to transport stuff. It is in that pouch that she puts her money, and thieves’ tools, but she also has her second flask of baijiu in it, and the marbles. Dangling on the right side of the pouch, attached on a strap that had probably been added just for it, there was a large bolt-cutter which hanged down past up to her knee. It was however padded in leather on kea spots so that it wouldn’t bang into any objects, making noise or damaging them. On the left side of the pouch there is a crowbar which is around 2ft long. There is a hole around 0.5ft from the top, through which there is a clasp holding it onto the pouch. On the center of the pouch there was a hammer, and on the side, on the strap she had a dagger. Point Blank Shot: You get a +1 bonus on attack and damage rolls with ranged weapons at ranges of up to 30 feet. Sneak Attack: If a rogue can catch an opponent when he is unable to defend himself effectively from her attack, she can strike a vital spot for extra damage. The rogue’s attack deals extra damage any time her target would be denied a Dexterity bonus to AC (whether the target actually has a Dexterity bonus or not), or when the rogue flanks her target. This extra damage is 1d6 at 1st level, and it increases by 1d6 every two rogue levels thereafter. Should the rogue score a critical hit with a sneak attack, this extra damage is not multiplied. Trapfinding: Rogues (and only rogues) can use the Search skill to locate traps when the task has a Difficulty Class higher than 20. Finding a nonmagical trap has a DC of at least 20, or higher if it is well hidden. Finding a magic trap has a DC of 25 + the level of the spell used to create it. +2 Dexterity, +2 Intelligence, –2 Constitution: Elves are nimble, both in body and mind, but their form is frail. Medium: Elves are Medium creatures and have no bonuses or penalties due to their size. Normal Speed: Elves have a base speed of 30 feet. Elven Immunities: Elves are immune to magic sleep effects and get a +2 racial saving throw bonus against enchantment spells and effects. Keen Senses: Elves receive a +2 racial bonus on Listen, Spot and Search skill checks. Languages: Elves begin play speaking Common and Sylvan. Elves with high Intelligence scores can choose from the following: Carnivon, Celestial, Draconic, Goblin, and Wildlander. 1 dagger, weighted for easy throwing. Dealing 15 damage to any metal bars as thick as 1 inch these are a lot more subtle then your friendly barbarian smashing a jail window or city grate. Flint and Steel . ); sewing needle (5 sp); 2 waterskins (2 gp, 8 lbs. ); whetstone (2 cp, 1 lb.). The destroyer of Frenzied Beserkers everywhere. Forcing a balance check of 15, this can topple near every medium-sized foe you encounter (because seriously, who puts points in balance?). Turning transparent to allow the tracing of documents & signatures, this a handy little item when needed. When struck it gives off 30 ft. of light and another 30 ft. of shadow illumination that lasts for 6 hours. The fantasy equivalent of a flare. Pulchesa was born on 14th of Cahut. She grew up in small settlement of 20 or so wood elves, in forest. As she grew up she became more and more proficient with the use of her bow. Shortly after her first bow was given to her on her 45th birthday, she was already hunting enough food to feed herself. However, she then proceeded to have her bow skills improve so quickly that within a year she could easily find enough food to feed her family. 10 years later, her settlement was struck with a horrible plague that made the majority of the hunters unable to hunt, which threatened to make the tribe liable to die from starvation. Luckily, all by herself, Pulchesa managed to hunt and scavenge enough food to feed all the inhabitants until the sickness passed. In thankfulness, a magnificent bow was given to her. As time went on, her prowess in a large amount of skills increased to levels beyond those of anyone else in the group. After a while, her skills had grown to such heights that life in the woods no longer provided her with any challenges and so, she left and arrived in Avalon. On her trip there which lasted a few weeks, she learned a lot of information about the city, and so, almost as soon as she arrived, she went to the Arcadia tavern to seek locals, friendship, and hopefully jobs. Her bow is an item of wonder. It is stringed with a perfectly smooth silk string which is attached to a the handle which is a perfectly smooth piece of wood. It is a slightly curved length of oak, finely polished with no dents or nicks of any kind. If one were to look more closely, it would be seen that, in a very small, beautifully written script, there are the names of all the members of the settlement that she saved. The care and long hours that were spent to make this hours are so great that it makes it easier for Pulchesa to hit whatever she aims at. However, due to a need for money, to her great horror she was forced to pawn it until she could collect enough money to rent a room at Arcadia, and currently just has a basic bow.